Georgetown’s McDonough School of Business provides a transformational education through classroom and experiential learning, preparing students to graduate as principled leaders in service to business and society. Through numerous centers, initiatives, and partnerships, Georgetown McDonough seeks to create a meaningful impact on business practice through research and teaching. All academic programs provide a global perspective in a way that is unique to Washington, DC – the nexus of world business and policy – and to Georgetown’s connections to global partner organizations and a world-wide alumni network. Applicants must submit all of the following materials: an application form (online application is required); a resume; four required essays; official transcripts for all postsecondary academic work; two recommendations, from professional relationships; and an official GMAT score report. Interviews are encouraged but are conducted only at the invita...Applicants must submit all of the following materials: an application form (online application is required); a resume; four required essays; official transcripts for all postsecondary academic work; two recommendations, from professional relationships; and an official GMAT score report. Interviews are encouraged but are conducted only at the invitation of the school after the first application deadline. International students must submit an official score report for the TOEFL, IELTS, or Pearson Test of English in addition to the above materials. McDonough requires a minimum of 2 years of post-collegiate professional experience (and prefers 3 or more) prior to admission. "Georgetown MBA is located in the center of the government, business and non-profit worlds. The Georgetown name and network are strong, and we are a community. My classmates' diverse backgrounds make class discussions and teamwork more valuable. Everyone contributes a unique perspective." Career-minded students should find no shortage of post-school opportunities thanks to a “strong alumni network,” “great networking connections,” and “good access to recruiters.” Some suggest that “due to its smaller size (compared to other business schools), some employers do not spend as much time as they might at other institutions,” but because McDonough boasts “proximity to power sources in D.C.,” hard-working graduates can expect a “great upward trajectory” provided they take advantage of the “great recruiting sessions” and “strong career connections in the business world.” Though “the administration is relatively new,” students say they are “dedicated to improving the school.” An integral part of that is a new Director of Career Management, who works to be “extremely helpful in providing advice and consultation.”Employers who have hired McDonough graduates include: Citigroup, Booz Allen Hamilton, Credit Suisse, Merrill Lynch, AES, America Online, International Finance Corporation (IFC), 3M, American Express Company, Avaya, Bank of New York, Deloitte Touche Tohmatsu, Ford Motor Company, and JPMorgan Chase. Offering unparalleled access to global business, policy and thought leaders, the McDonough School of Business is seated at one of the nation’s most prestigious universities in one of the world’s most influential cities. Founded in 1789, Georgetown University is the oldest Catholic and Jesuit university in America.The Georgetown MBA Program develops leaders capable of making complex business decisions in a global environment and who are dedicated to serving their companies, society and humanity. Students gain solid grounding in all core management disciplines, with an emphasis on the global, ethical and political environment of business. Our commitment to understanding international business is demonstrated by the global curricula, strong presence of international students (more than one-third), and opportunities provided to study business and management in other parts of the world. 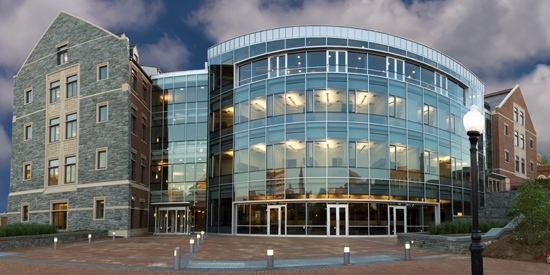 Georgetown MBA provides a general management framework with an emphasis on the global business environment. The curriculum's organization – into intensive team-based experiences, courses that integrate various functional areas and elective courses that offer choice – is designed to give students the tools and skills they need to anticipate, analyze, and solve increasingly interrelated, complex business challenges. Students may choose courses according to individual interests and career goals and also pursue summer internships or study abroad programs. All students are required to undertake a foreign residency, the Global Integrative Experience, in which teams work on real consulting projects for companies in cities around the world. Recent locations have included Dubai, Ho Chi Minh City, Johannesburg, Prague and Sao Paulo. Fresh from their summer internships, second-year students are exposed to the depth of the material through elective and selective coursework which allows a greater focus on their preferred business area. Additionally, second-year students undertake a required foreign residency, the Global Integrative Experience, in which teams conduct a consulting project for an international company and present their recommendations to top managers at their places of business abroad. Second-year students travel to the county in which their project company is located and present their findings to top management. Every student has the opportunity to choose courses according to individual interests and career goals. Past locations include London, Rome, Prague, Hong Kong, Ho Chi Minh City, Delhi, Buenos Aires, and Sao Paulo. Beginning in 2006, projects will also take place in Johannesburg, South Africa. There are striking differences between the first and second year of study. The first year is intended to provide a breadth of knowledge of core business functions such as economics, accounting, statistics, marketing and finance. Additionally, students are introduced to international business and management as well as elective studies through which students can investigate topics of particular interest. The Georgetown University McDonough School of Business Gay and Lesbian Alliance (GALA) serves members of the Georgetown MBA Program who identify themselves as gay, lesbian, bisexual, or transgender (LGBT), as well as those who support this community. The mission of GALA is to foster a supportive environment for professional development, provide a forum for the discussion of business issues related to sexual orientation, and facilitate social interaction and networking among students, alumni, and professionals. Members of the Black MBA Association (BMBAA) are committed to making a difference in local, regional, and global communities through the investment of individual and collective professional resources in activities that promote ethical business strategy and compassionate social interaction. The associationÂ’s purpose is threefold: to encourage excellence in academic preparation and professional development of MBA candidates of African descent, to cultivate the presence of students of African descent as members of the Georgetown community and enrich the academic and professional environment at GeorgetownÂ’s McDonough School of Business, and to engage in structurally organized activities in the areas of recruitment, retention, and placement of students of African descent in the Georgetown MBA Full-Time Program. The MBA Program Office offers free peer tutoring services to first-year students in core subject areas. Students in need of a tutor do not need to make an appointment, they can simply stop by during specified office hours. The tutors are faculty recommended second-year students who have excelled in the core subject areas. Formal study abroad programs offered at Oxford University and London Business School (England), ESADE (Spain), HEC (France), Fudan University (China), and IAE (Argentina). 2011 Global Residency locations included: Sao Paulo, Buenos Aires, Johannesburg, Shanghai, Beijing, and Ho Chi Minh City. Georgetown Women in Business is a chapter of the National Association of Women MBAs (NAWMBA), an organization dedicated to educating and promoting the role of women in the workplace. Georgetown Women in Business seeks to accomplish this goal by providing networking, recruiting, and career-building events and opportunities for women throughout the Georgetown MBA Program. Michael Chasen - Co-Founder, Blackboard Inc.
Want more info about Georgetown University, McDonough School of Business Full Time MBA? Get free advice from education experts and Noodle community members. What is the social scene like in Georgetown?